Coleus (Black Dragon) - If you want to add some hot color into the shade border or sunny window this season, then look no further than 'Black Dragon' Coleus. This Coleus is an unusually richly-textured, warmly-colored foliage plant. Compact, very showy, and easy to grow, it's a must-have for anyone with a patch of shade to call their own! 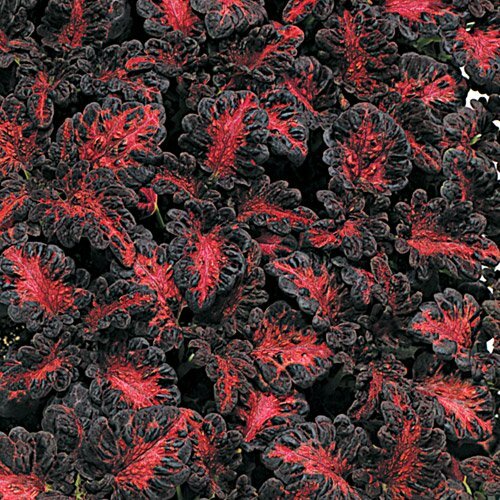 The leaves are spectacular, both for their red-to-midnight-purple color shading and their rippling edges, which give the plant much more presence than most Coleus. The leaves will turn color and begin to pucker at a very early age, making this one of the most fun seeds to start indoors.